The Nationals now have posted a Ballpark A to Z Guide with answers to just about every question having to do with the operations of the ballpark that you could possibly think of. 1. Where is Nationals Park? 2. What does the ballpark look like? What was there before? 3. How much did the stadium cost? Who's paying for it? 4. I've heard it's a riverfront stadium. Is that true? 5. I've heard you can/can't see the Capitol Dome from within the ballpark. Is that true? 6. When was the first game at Nationals Park? 7. Are there other non-baseball events at the stadium? Note that the stadium site is in Southeast DC, but is not in "Anacostia." 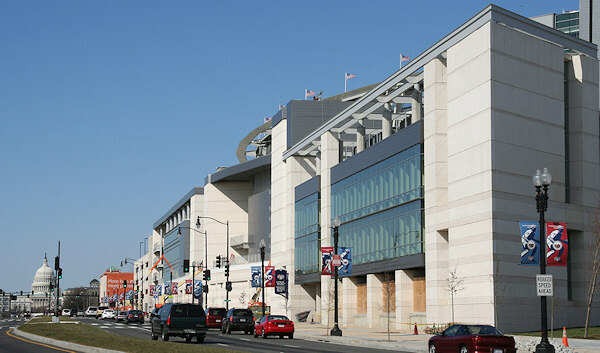 The Anacostia neighborhood is on the east side of the Anacostia River--the stadium is on the west side of the Anacostia River. You can also see many of the renderings of the ballpark released over the past three years, as well as a gallery of the buildings that were demolished in Spring 2006 to make way for the stadium. Nationals Park is a publicly funded stadium; Washington DC agreed to fully fund a stadium as part of the deal that brought the former Montreal Expos to Washington. The city council capped "hard expenditures" for the ballpark (including construction and land acquisition costs) at $611 million and so far the ballpark continues to be billed as "on budget", though lawsuits from the seizure of land for the ballpark via eminent domain have not all been settled. 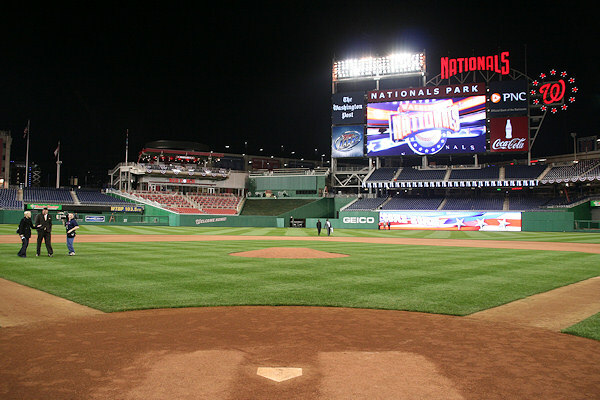 The city owns the ballpark, and it is operated by the DC Sports and Entertainment Commission. The ballpark has been paid for by the sale of $535 million in municipal bonds, which will be repaid by stadium-generated revenues and by a tax on businesses within the city. No money was taken from the city's general fund to pay for the stadium. Certain upgrades at the park that would break the cost cap are being paid for by the team's owners. For more on the deal between the city and the team, see the Feb. 2006 Project Lease Agreement. While the stadium is not right on the banks of the Anacostia River, it is only a short distance away. Diamond Teague Park and Piers is across the street from the ballpark's southeastern entrance, linking the stadium to the riverfront. And the property immediately to the ballpark's south, which is now a somewhat unsightly concrete plant, is destined to become RiverFront on the Anacostia, a 5.8-acre mixed-use development with offices, residences, and retail. And the Anacostia Riverwalk Trail will eventually run along the riverfront for miles in each direction. (Top) A view of Nationals Park from across the Anacostia River, at Poplar Point; (Middle) Looking to the east along the Anacostia River from the ballpark's southeastern viewing platform. The green area at center is now Diamond Teague Park, a public plaza that will provide access to the riverfront. At lower right is part of the concrete plant that will become RiverFront on the Anacostia. 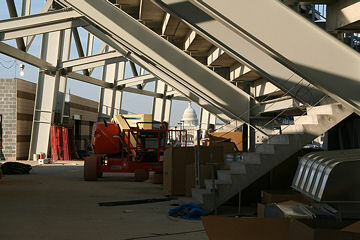 The U.S. Capitol dome as seen from inside the upper concourse along the third base line (left) and from the press box (right). There are currently views of the Capitol dome from positions around the ballpark, though more along the first base line in the outfield and close to the press box. One completed building north of the ballpark--20 M Street, owned by the Lerners--blocks view the view of the Capitol for many seats near first base in the upper decks. The west parking garage and 20 M block the view of the dome for most seats in the lower bowl. 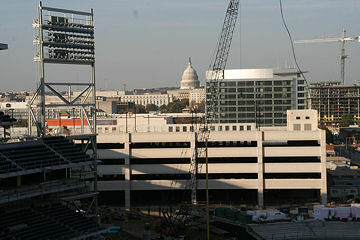 Even seats that had a view of the dome on Opening Day 2008 may lose it as development of the blocks north of the stadium continues. Dome views from the third base line and from the northwest viewing platform will probably last a few years longer, as developments that would destroy that sight line are not imminent. Early views of the dome from the right-field bleachers (seen here in March 2007) have since been obscured by development north of the ballpark. 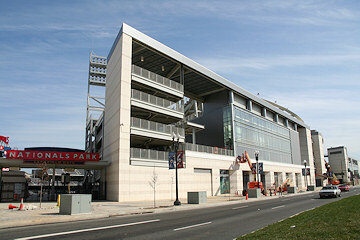 The first baseball game at Nationals Park was between George Washington University and Saint Joseph's University on March 22, a game open only to GW students and not the general public. The first Nationals game at Nationals Park was on Saturday, March 29, 2008, an exhibition game between the Nationals and the Baltimore Orioles. The first "real" game was the season opener against the Atlanta Braves on Sunday, March 30, 2008. The city is allowed to have up to eight non-Nationals events a year at the ballpark. Pope Benedict XVI offered mass at the ballpark on April 17, 2008, and a new citywide high school baseball title game is being played at Nationals Park each year at the end of May. The first music concert was a Billy Joel-Elton John concert on July 14, 2009. Joel Osteen Ministries is having its Night of Hope on April 28, 2012. Regular Seating: Nationals Park has 41,888 seats. That number includes 22,000 in the lower bowl, 2,500 club seats and 12,100 upper level seats. Premium Seating: Two club lounges offers 1,800 seats to fans in two indoor locations. The 500-seat Founders Club and the 1300-seat Diamond Club provide both bar and dining services. Suites: A total of 78 suites offer 1,112 additional seats. The suites include eight 16-seat Founders Suites on the main level, two 24-seat Owners Suites, 58 12-seat standard suites on two mid levels and ten 24-seat Party Suites on the mid level. Other Accommodations: The Red Porch Restaurant, a separate restaurant and bar overlooking the outfield, includes 10,000 square feet of space. Concessions and Retail: A total of 28,000 square feet of concession stands will provide refreshments to fans during events. Retail and novelty outlets will offer merchandise from 7,700 square feet of space. There will be 183 concession "points of sale" and nearly 65,000-square-feet of restaurant space. And 41,222 cupholders. Family Entertainment: A 15,000-square-foot family area called the Strike Zone will be available in the ground floor of the eastern parking garage. It includes a Build-a-Bear workshop, a karaoke station, batting and pitching cages, and more. Comfort and Convenience Facilities: There will be a total of 1,100 restroom fixtures. ATM's and first aid stations. There will be between 33" and 42" of legroom between rows, compared to 26" inches at RFK. There are eight escalators and seven elevators (compared to 7 and 1 at RFK), and the main level concourse is 40 feet wide, compared to 19 feet at RFK.